At Comic-con Saturday, the audience for Hall H—some having waited in line all night—lost every ounce of their minds as soon as Warner Bros. panel moderator Chris Hardwick (who acknowledged gratefully the lengths some fans had gone to) queued up the DCEU roll-out. First up, the confirmation of the titles to come: Justice League Dark, Green Lantern Corps, Shazam!, previously announced Wonder Woman II, the Matt Reeves-helmed The Batman (more on that in a sec), and the Flash solo outing, Flashpoint. Jason Momoa then strutted up from the back of the hall, carrying Aquaman’s trident and eating up shriek after shriek from the worked-up fans—both women and men, because if there’s one thing that’s clear, it’s that Jason Momoa is inhumanly studly. Momoa played the trident like a guitar, sorta bounced around stage, threw Hardwick the trident (“Hey, it’s me, Aquakid!” Hardwick declared as Momoa loomed over him) and then settled down to premiere what he could from James Wan’s Aquaman, which included an introduction from Wan followed by a small vignette that Wan admitted he threw together so fans had something at Comic-con. All we really got to see was a boat filled with two fisherman-looking fisherman, one of whom snags a big catch that, after some stereotypical “tiny boat gets dragged by something that’s obviously not a fish” kind of slapstick, turns out to be an elaborate, aerodynamic submersible. The camera dips beneath the waves to reveal Ocean Master’s army, swag-surfing on shark-like creatures and otherwise amassing all sorts of aqueous looking ships. If unfinished, the footage looked predictably impressive, even though there’s no explainable reason as to why two fishermen in a rowboat would be out in the middle of the ocean. 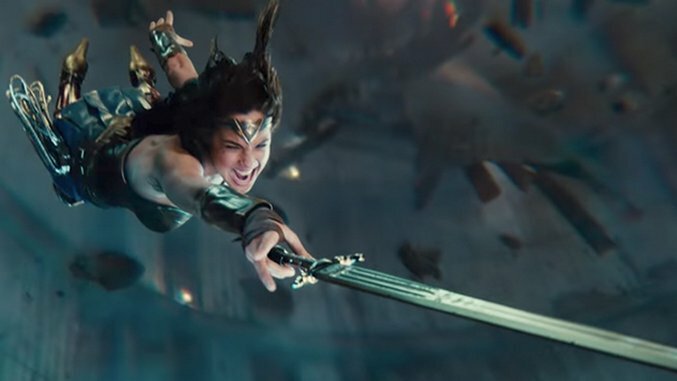 Hardwick then announced that tomorrow it’ll be news that Wonder Woman will be the highest grossing film of the summer so far, asking Gadot why she thinks it’s blown up. Asked about Cyborg, Fisher described how his character and Flash (Miller) find common ground. “Cyborg and Flash, they get their power through total accidents, and I think that bonds them in a very specific way, both through the trauma that they had, but also through the fact that they’re the youngest members of the group,” he said. Ah, trauma. And the crowd goes wild. So yeah, the big reveal there is the film’s villain: Steppenwolf. The baddie’s army of Parademons were first glimpsed in that desert segment from Batman v Superman that for the most part made no sense. Another observation: Despite all the egregious slo-mo and the bowel-obliterating explosions, might this actually be a kinda funny movie? So super-charged on seeing the trailer, the cast hugged it out and Momoa threw his chair. Seeing that it didn’t break, he slammed it on the ground, but stopped once he realized he’d need to sit down again. During audience Q&A, the cast then shared how each of them got the news they’d won their respective parts: Affleck and Momoa in director Zack Snyder’s office—Momoa revealing that Snyder surprised him with the role, to which Momoa responded, if anything the guy says is to be believed, with confusion (“Pardon me? )—Gadot on a plane, Miller eating fish in Costa Rica and Fisher in his apartment, screaming out obscenities. Justice League comes out in November.